February 19,2010 – de GRISOGONO is pleased to announce they dressed the stars last night during the fantastic charity fashion show held at Somerset House for Naomi Campbell’s Fashion For Relief™ benefiting Haiti. Fashion For Relief™ took center stage at the British Fashion Council’s official London Fashion Week show venue. This year it was held in aid of The White Ribbon Alliance as it advocates for the health needs and rights of women and girls around the world, especially supporting its partners in Haiti at this time to rebuild the health care system for mothers and babies. Funds raised at Fashion For Relief™ will go towards making sure mothers and babies are at the heart of the Haiti’s new health system, and to ensuring that this essential work continues in other countries where women are at risk of dying when they give birth. Fashion For Relief™ brought together on the catwalk, top international faces of fashion, music, film, TV, sports and society. The show featured glamorous clothes by the world’s most renowned and respected fashion designers including Vivienne Westwood, Jaeger, Dolce & Gabbana and Alexander McQueen. On behalf of de Grisogono, Founder and President Fawaz Gruosi was very saddened with the news of Alexander McQueen’s passing – a true innovator of British and International Fashion. Those wearing de Grisogono included the likes of David Gandy, Jo Wood, Sinita, Pixie Geldof, Valerie Campbell, Jamelia, Freddie Flintoff, Piers Morgan, Zaha Hadid , Violetta Gruosi (daughter of founder and president of de Grisogono, Fawaz Gruosi) and of course Naomi Campbell. de Grisogono is proud to be one of the prominent brands supporting this year’s Fashion For Relief. Known for his designs, Fawaz Gruosi began designing watches in 2000 with his Instrumento Uno – today has more than 20 collections incorporating the spirit of the brand, boldness and creativity. ‘I am proud to be once again supporting my dear friend Naomi and her great efforts towards this cause’. 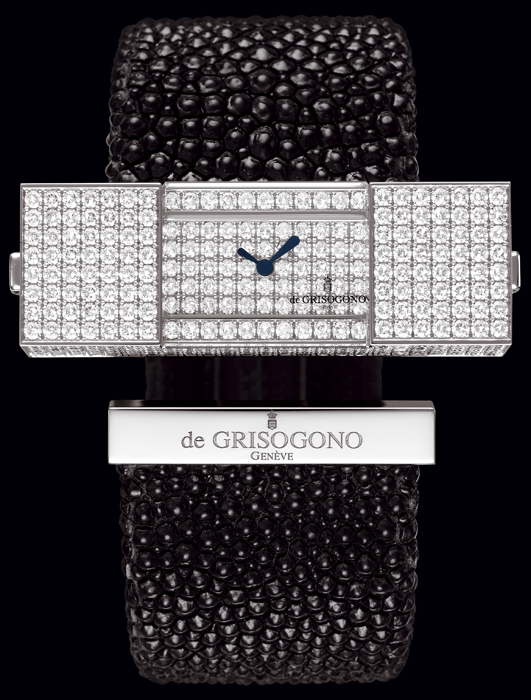 As well as the array of stunning watches seen on the catwalk, de Grisogono also participated in the charity auction. The luxury Swiss watchmakers gave away two pairs of beautiful matching ‘His and Hers’ watches for the winner of the amazing auction lot. 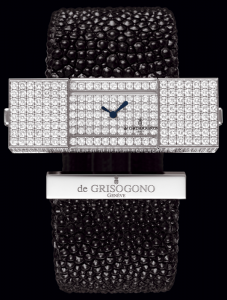 Famed for creating watches of exquisite beauty – the first set auctioned was the FG One N03 Blackened Steel Retrograde Dual Time Zone for him and an Instrumentino N12/A, also Blackened Steel, with Diamonds for her. The second set was an Instrumento No. Uno DF N12 a Platinum cased dual time zone watch, with a Sapphire crystal back for him and hers is the diamond-laid bracelet, Steel watch, the Instrumentino N07/B.